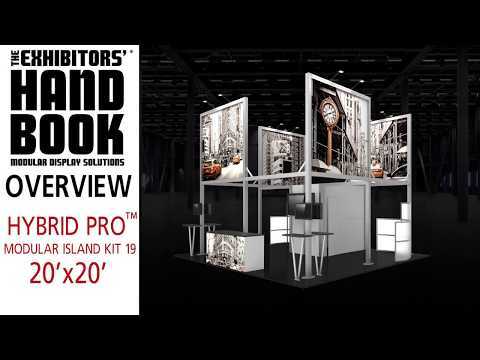 Hybrid Pro™ Modular Kit 19 is an eye-catching 20ft x 20ft island exhibit, perfect for the serious exhibitor. Kit 19 features a heavy-duty aluminum extrusion frame coupled with seamless push-fit SEG fabric graphics. 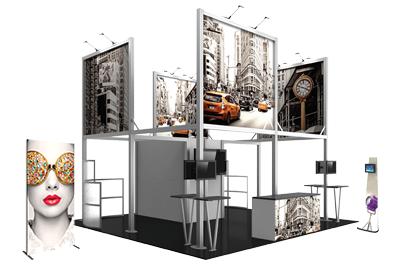 Four towering display panels rise 15' 9" to the ceiling and provide the ideal messaging solution across a busy show floor. A central storage room provides a secure space to keep additional materials. Two semi-private meeting areas feature curved frosted plex infills, and dual monitor mounts provide the ability to integrate digital messaging easily. LED display lights atop the structure illuminate messaging so that it is easy-to-see across the show floor.